Reception: Saturday, January 5th, 6-9 pm. Reading at 7pm, followed by an artist talk. 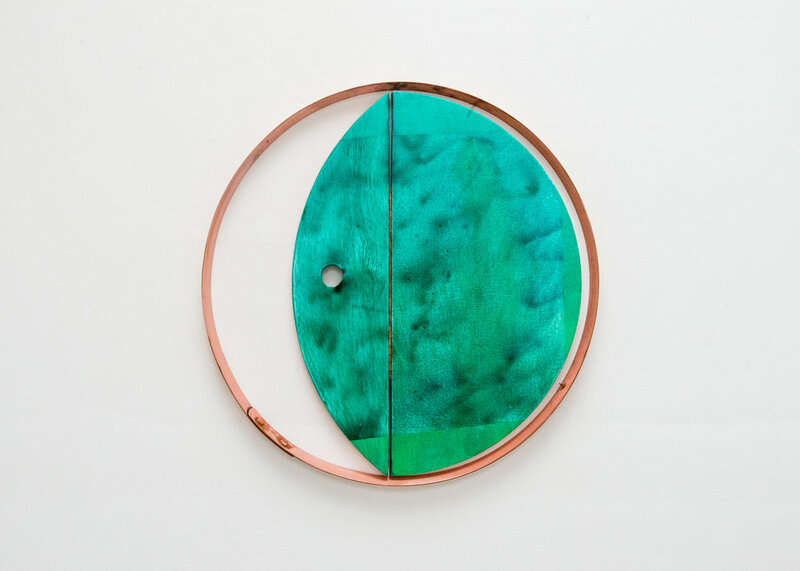 Lana Williams, Whole Hole, Installation View, 2019. Interface Gallery is pleased to present Lana Williams’s third solo show with the gallery. In this exhibition, entitled Whole Hole, Williams builds on the language of her abstract, shaped paintings. Williams’ interest in the structure of the canvas and the relationship between paintings and frames serves as a way for her to think about boundaries, expectations, and desires. Often, the canvases do not fit within their frames or even frame the frames themselves. In this new series, hinges attached to the paintings suggest movement and highlight the interdependence between painting and frame, negative and positive spaces. Openings formed by the negative spaces allude to windows, doorways, and passages – gaps into which we might slip? As always, color and texture play an important role in Williams’ work, creating a dynamic sense of movement and depth. A new writing by Brandon Brown entitled "Things to do in the New Year" will accompany this exhibition. Brown responds in part to the theme of boundaries, expectations and desires in Williams' work, taking the New Year as a wildly artificial boundary that can generate enormous effect in us, particularly regarding our expectations and desires. (Download writing here). This exhibition is part of a new series at Interface pairing solo presentations by visual artists with newly commissioned writings by Bay Area writers. The writings and the exhibitions are viewed as entirely independent but are designed to complement one another. Lana Williams is an Oakland-based artist and 2013 MFA graduate of the San Francisco Art Institute. Williams has shown at galleries in San Francisco, Oakland and New York. She was featured on KQED Arts in an article, “Bay Area Painting Right Now: Lana Williams Breaks the Rules.” Her work has also been written about by SFAQ, Curiously DIrect, and the East Bay Express. While Williams' abstract paintings are influenced by Abstract Expressionism and Minimalism, her range of materials, from smoke bombs to dye and plaster, and her play with shaped canvases connects her work to the field of expanded painting. The work's refusal to adhere to the rules is a kind of proposition for us to break out of expectations that can be limiting. Her works often have titles such as “Pose,” referring to the ways paintings perform, but also how we perform. Brandon Brown’s most recent books include The Four Seasons (Wonder), The Good Life (Big Lucks), and Top 40 (Roof). He is a regular contributor to Art in America, and recent work has also appeared in Frieze, Open Space, Jacket2 and Harriet, the magazine of the Poetry Foundation. With J. Gordon Faylor, he has written four volumes of Christmas poetry, including 2018's The War on Christmas. He lives in El Cerrito. Lana Williams, Moon Block, 2018. Acrylic, oil, sculptamold, copper plated steel, copper plated hinge. Lana Williams, Waxing Waning, 2018. Acrylic, oil, oil stick, smoke pigment, copper plated steel. Acrylic, smoke pigment on canvas, steel frame. Acrylic, oil, dye, bleach, smoke pigment on canvas, steel frame. Flushed but not fixed, 2018. Acrylic, smoke pigment, on canvas, steel. 38 x 34 5/8 inches. Acrylic, smoke pigment, and oil on canvas, steel. 33 3/8 x 13 1/4 inches.